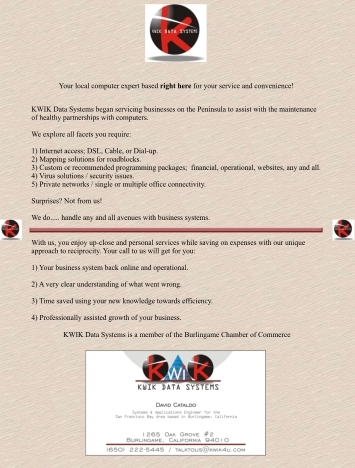 KWIK Data Systems. The link for upwardly mobile business. Our people-oriented IT company was founded by John Watson and David Cataldo and specializes in meeting the technology needs of small-to-medium sized businesses. We began just a few years ago by advertising locally through City entities as you see here. Experience gained over the early years caused us to set out independently, offering our talents to local businesses with service that cares. Our approach seems to have worked, as we are now in our 5th year of business and GROWING! As we have helped guide the business community to the far reaches of technology, we have become a distinct partner in the quest for efficiency. When it comes to your time and money, you have no higher an entity to trust than KWIK Data Systems.